When it comes to opening up, people can be reluctant. However, when we asked students to open up their bags for us, we were surprised at how eager they were to do so. Read ahead to see what we found, and reflect on what the contents of your own bag reveals about you. 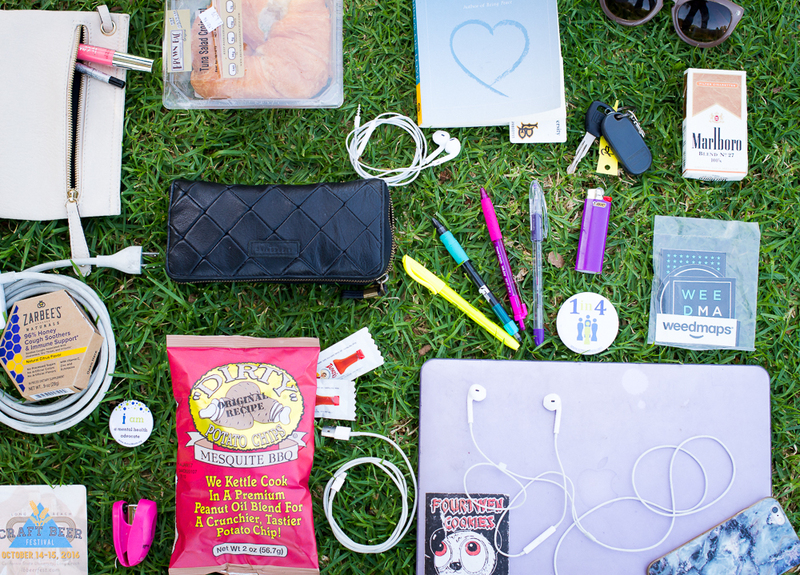 Junior design major Nina Pham was surprised to discover how neat her bag was. Inside her bag were art supplies, including two sets of pastel-colored pencils, sketch pad and pencil case filled with mechanical pencils and black pens of varying tip sizes. Also in her bag was her wallet, earbuds, laptop charger and laptop. Pham said her most essential items are her pencil case and laptop. “The pencil case and MacBook have gone through a lot with me. I can’t live without them,” she said. In addition to her bag, she also carries a 24x36-inch sketch pad to her classes twice a week. As an artist, Pham says all these supplies are necessary to bring with her on the daily for her classes. If it were up to her, though, the only art supplies she would bring are her pencil case and sketch pad, since her preferred medium is black-ink work. Her bag is strictly for school, and she chooses to pack significantly lighter on her off time, including her mainstay essentials— a couple of lipsticks, a wallet, a phone and her keys. Vladimir Ickert, a graduate German international student who is studying industrial engineering, can relate to the idea of wanting to pack light. “There’s nothing impractical [inside my backpack]; just everything I need,” said Ickert. He went on to joke about how his backpack is very much a typical guy’s backpack. “Girls put everything in [their bags] they may need… someday,” he said. Ickert’s self-described “practical and comfy” backpack holds his laptop, tablet, earbuds, USB, calculator, turkey and pepperjack cheese sandwich, granola bar, water bottle, pack of gum, keys and change of clothes for the gym. However, not everyone chooses to carry the bare necessities. Harlee Morikawa, a super senior women’s gender and sexuality major, hauls quite a few extras. She carries everything from a laptop cord and cough medicine to chips and cigarettes. Morikawa knows it’s unnecessary to carry the cigarettes with her to school with the current smoke-free policy. “I have them more for comfortability,” said Morikawa, who stated she plans on quitting before she turns 26. The main downside of carrying so much is that things can get heavy. “[My bag] is big so it carries everything, but it really hurts my shoulder,” she said. Among her electronics, she carries two pairs of earbuds— one, which she accidentally mistook as her own when they’re in fact her boyfriend’s— her phone, laptop charger and laptop. “My laptop is always at full storage because it has my whole life on it,” said Morikawa. A couple fun extras in her tote include a pair of sunglasses and some makeup. And just like Beyonce, she’s got hot sauce in her bag, swag. She admits that she loves spice so much she would even put it in the sandwich she had packed for lunch. What people carry day in and day out can give us a glimpse of a person’s personality, but it’s important to remember that it would be difficult for anybody’s contents to paint a complete picture of who they really are. “I feel like even though there are a lot of bits and pieces here, it only reveals an aspect of me,” said Morikawa.